At 75 years, the Air Force Aid Society continues its tradition of Airmen helping Airmen, and educating America’s future leaders. In the darkest days of a world at war, most Americans thought only of the grim present. Many American men were in the military, and they and their families knew the risks all too well. They watched newsreels and read newspaper accounts of their loved ones engaged in fierce battles in distant places. In the skies over Great Britain, Germany and the South Pacific islands, young American Airmen put their lives on the line for their country and the world’s freedom. At home, their families held their breath, and put any long-term plans for education, career or finances on hold. It was in this most uncertain of times that General Henry “Hap” Arnold, Commanding General of the Army Air Forces, and his wife, Bee, turned their thoughts to the future. It was March 1942. America had only been in World War II for a few months. Yet young Airmen were losing their lives at an alarming rate. What would happen to their families now that these men were no longer alive to support them? Who would ensure that their children would one day get the education they needed to become America’s future leaders? When the world was consumed by war, General Hap and Bee Arnold chose to sow the seeds of optimism about America’s future. This positive focus was in keeping with the General’s personality: he earned his nickname – Hap – while in the U.S. Military Academy at West Point for his sunny, happy disposition. Home movies of the Arnolds show a family of smiling, active children and the close, supportive relationship they had with their parents. It was just this type of support the Arnolds wanted the children of deceased Airmen to enjoy as they grew up. When Airmen lost their lives, their wives and children could find the financial support they needed to stay in their homes and finish their education. Today, the Air Force Aid Society keeps that flame the Arnolds kindled burning brightly, with programs that include emergency grants and no-interest loans to help Airmen with unexpected financial needs, as well as scholarships to help dependent spouses and children of Airmen pay for college. “General Arnold and Bee, a compassionate observer of the war, saw the tremendous losses the Army Air Corps had in World War II,” says Lt. Gen. John D. Hopper, Jr., Chief Executive Officer of the Air Force Aid Society. The Army Air Corps suffered some 64,000 casualties in the war. “When you would lose a B-24 or a B-17, you’d lose ten or more Airmen at a time. It was an accomplishment just to survive 25 missions. The losses were extremely high. So General Arnold thought, ‘What will happen to the children?’” The available solutions were simply inadequate, the late General realized. In 1942, the Air Force was not yet a separate military service, but part of the Army. 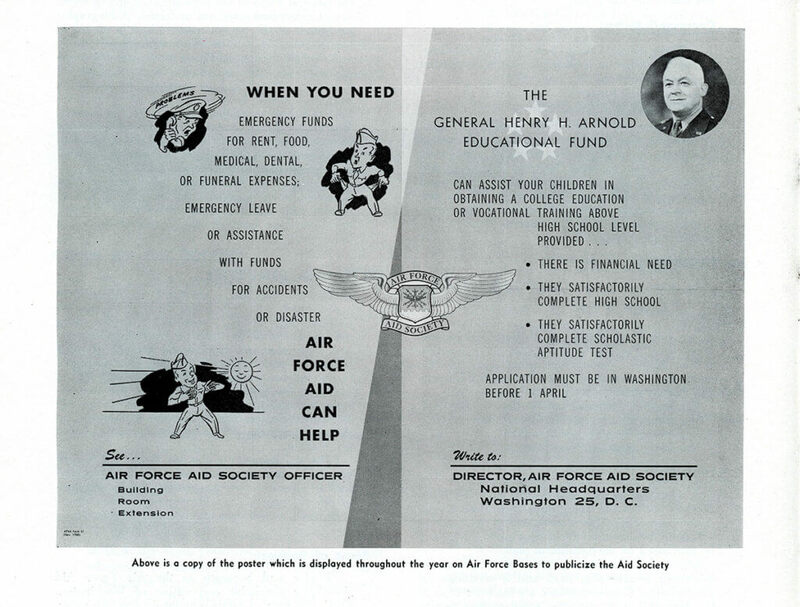 In the first report of the new society created to benefit Airmen, Gen. Arnold noted that it was chartered “because the Army Relief Society, due to provisions of its constitution, was not able to meet the demand of all our Air Force personnel.” Funds provided by both the American Red Cross and Army Emergency Relief went into a “common pot,” but the Arnolds knew more funds needed to be raised and designated just for the needs of Airmen and their families. The Arnolds saw how war affected Airmen’s families first-hand. In 1942, a young airman, Edward V. Rickenbacker, known as “Iron-Man Eddie” to many, was nearly lost at sea during a secret mission for General Arnold in the South Pacific. Rickenbacker was rescued and reunited with his wife and children, but eight other men on that mission lost their lives. Rickenbacker wrote the dramatic story of his rescue for Life magazine, donated the proceeds to the Air Force Aid Society – and became the Society’s first Board of Trustees President. The immediate crisis for the new organization’s leaders was to support the families of Airmen lost in the war. Its first Memorial Honor Roll was established in 1943, and the numbers listed would only grow as the war deepened. 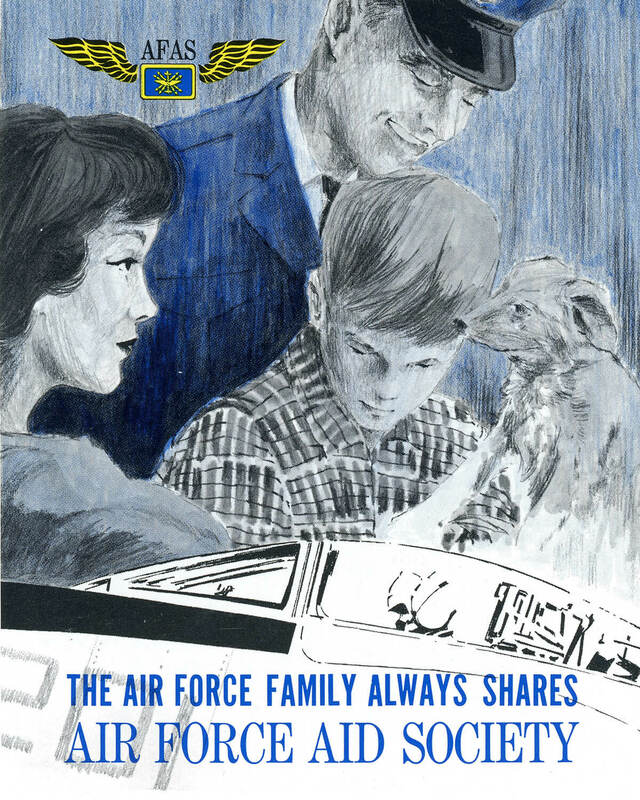 The Air Force became a separate branch of the Armed Forces in 1947, and its society continued efforts to build a trust fund for the “emergency relief” and post-war educational needs of Air Force personnel and their dependents. Early fundraising efforts were challenging. Americans’ budgets were tight. Some of the earliest supporters were the Officers’ Spouses Clubs, women who felt the sting of wartime’s deprivations first-hand. By the 1950s, aeronautics corporations Lockheed and Boeing stepped in with large annual commitments, and the Air Force Aid Society began staging Charity Balls in 1964. The first ball was held at New York’s Waldorf-Astoria Hotel, raising $90,000 – which would be close to $700,000 today. Throughout its 75-year history, the Air Force Aid Society’s most dedicated fundraisers and donors have been Airmen and their families. 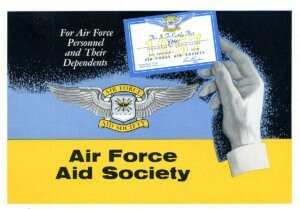 The Air Force Aid Society donates around $15-16 million each year. Funds are distributed for emergency assistance in the form of either no-interest loans or small grants. These dollars may pay for an Airman’s emergency car repair or a plane ticket to travel to a parent’s funeral, Gen. Hopper notes. In 1988, the society added an education grant. Grants and scholarships are awarded based on family financial needs and merit, and applicants must meet high academic standards. Education was part of the Arnolds’ core vision for the society when it was founded, says Judge Moorman. The current Board of Trustees Vice-President at Air Force Aid Society, retired Major General Alfred K. Flowers, recently watched a group of Air Force spouses celebrate their graduation from nursing school at San Antonio’s Lackland Air Force Base – education funded in part by one of the Air Force Aid Society’s many programs. Gen. Flowers credits current Society CEO Gen. Hopper for the innovative creation of a grants program for emergency needs. “When we have Airmen who are in trouble, if they can’t pay this money back, why add to their woes? Need-based grants can enable a family to thrive. We recruit members but we retain families. If a family is stressed or unhappy, we will lose them,” says Gen. Flowers. Recent crises like Operations Desert Shield, Desert Storm, Iraqi Freedom and Enduring Freedom, as well as the 2008 economic downturn when many Airmen’s finances and mortgages were in peril just like everyone else, highlight the continuing need for the Air Force Aid Society’s mission. Gen. Hopper saw that in tough economic times, an Airman might be his family’s only steady source of income. While the Air Force Aid Society’s Emergency Assistance loans and grants typically help Airmen who are between 18 and 32, its General Henry H. Arnold Education Grant program often benefits older Airmen with college-age kids, Gen. Hopper shares. Even small gestures to Airmen and their families make a big impact, says Judge Moorman. The Air Force Aid Society provides assistance items like gift cards to Airmen with new babies, and offers for free oil changes or other car maintenance to spouses of deployed Airmen through the AFAS Community Enhancement Programs. Even small outreach efforts go a long way to alleviate the stresses these families may experience, he says. The Air Force Aid Society is a 501(c)3 charitable organization that receives the highest, four-star rating from Charity Navigator™, a benchmark for fiscal prudence among nonprofit organizations. That designation speaks to how well the organization is managed, with low overhead so a high percentage of dollars goes to the cause, not the effort to raise money. “You won’t see us out in public fundraising a lot, but a great amount of the money we raise is donated by Airmen and those who support Airmen,” says Gen. Hopper. In 2004 after a hiatus, the Charity Ball was revived, and the event continues to this day in Washington, D.C., not far from the society’s headquarters in Crystal City, Virginia. It’s not just at these gala events or from corporate donations that these important funds are raised, but by everyday Airmen at their duty bases, or family members and other “compassionate observers” making online donations of any amount. Whether small or large, these donations add up to provide a safety cushion for Airmen in need, and as a vital investment in the education of tomorrow’s leaders. General Hap and Bee Arnold had a bold vision in a time of war. At the war’s end, he gave a speech to “thank all those who fly and those who make flying possible.” He understood that no one soars to victory or achievement alone – we are all connected and must support each other as a family. In today’s environment, Airmen have many challenges still – and the Air Force Aid Society’s mission is as important as ever, says Gen. Hopper. “Airmen are going out on tours of duty, coming back, and redeploying. These cycles are tremendous stressors on Airmen and their families. Anything can go wrong. The Air Force Aid Society is the official charity of the U.S. Air Force and has been meeting the unique needs of Airmen and their families since 1942. AFAS works to support and enhance the USAF mission by providing emergency financial assistance, educational support and community programs. Last year alone, AFAS provided nearly $15 million in direct support. Visit afas.org to learn more.